How about them apples? Which apples, you say? Your best ones! Sweet as apple pie, or savory as, er, apple–something else. We want to see it all: Sweet, savory, tangy, unpredictable, and everything in between. Classics are great; so are new friends. We’re looking for another favorite apple cake, readying our pulled pork sandwiches for a slaw to end all slaws, and hoping just a little bit that you’ll convince us apple pizza isn’t as weird as it sounds. Apple should star. Fresh apples should be front and center. From there, go nuts—juice ’em, sauce ’em, make ’em into a jam, dice ’em up into tiny little bits and build a six-foot sculpture with the pieces; we’re open to it all. That said, apple-adjacent stuff—like, cider vinegar, or bottled apple brandy, or apple-flavored candy—is more than welcome on the ingredient list, but should play a supporting role to some form of fresh apple. From A to Z. 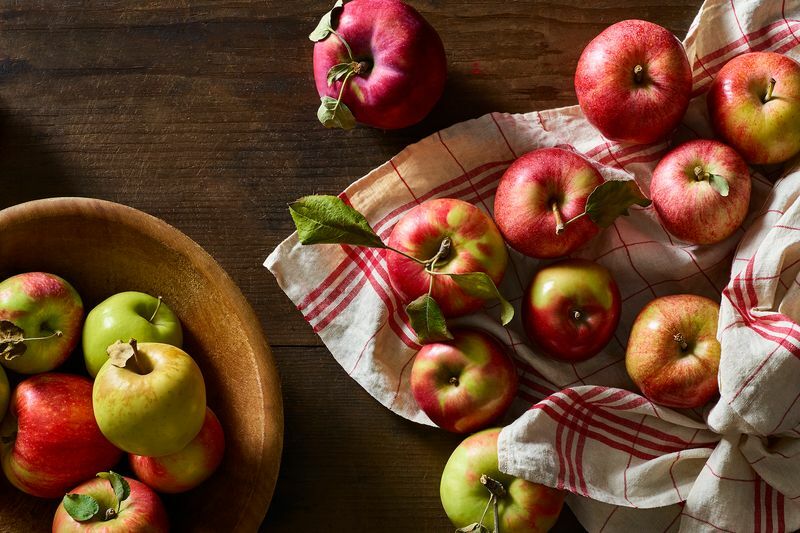 “A” is for “apple,” but it’s also for “appetizers.” (We’d tell you what “z” is for, but there’s a limit to how many cutesy idioms we’re allowed to include in a single apple contest post.) We’re looking for any apple-based dish, whether it peeks out from an hors d’oeuvre platter, shows up all jammy on a sandwich, sits alongside a pot roast, graces a pie crust with its presence, or surprises us in some other way. If you have an apple recipe already on the site, go to that recipe page, hit “Edit Recipe” (under the photo), scroll down, hit “Submit my recipe to a contest,” select the apple contest, and save. If you want to add a new recipe, head to your own profile page, select “Recipes,” click “Add a Recipe,” upload it, hit “Submit my recipe to a contest,” select the apple contest, and save. We read every submission and test as many as possible. But that’s a lot of reading and a lot of testing. We’re counting on you to help, too. Peruse the submission pages and make (and favorite!) any recipe that catches your eye. Then, share feedback on the recipe page. We take all this feedback into account as we narrow down to the top five, which will be announced on October 15. For a full refresher on how the whole contest process works, head here. What themes would you love to see in future contests? Let us know in the comments below!